Facing a howling wind, I squint my eyes. The gravity of my own weight is reassuring, as it anchors me along Aewol village’s coastal walk. It’s the beginning of fall, and the rough waves are shooting salty droplets toward my ankles. Just minutes away from our stone house, I regularly encounter Jeju Island’s wind, volcanic rocks and women of the sea. During low tide, the local free divers, known as haenyeo, search for sea urchin, turban shells and abalone. Whenever I spot them, I feel optimistic and robust. If they can dive well into their 80s, then I have no excuse to mourn as I enter my 70s. This decade shall be endowed with new beginnings. My husband and I have been coming to Jeju Island every year since 2011. Our stays began as short visits. Jeju, we rationalized, would be our annual get-away destination from the United States. But each year, our visits became longer and our relationships deeper. After surviving the sudden death of our younger teenage son in 1994, I have since navigated my healing journey not only inwardly, but outwardly toward places that bring us comfort and joy. Although known for its natural and healing beauty, Jeju Island has also survived its own dark history: Japanese occupation, the Korean war and the genocide during the April 3 Uprising and Massacre, known as SaSam. Their vulnerability and han (suffering)—far greater than mine—resonates deeply with my own loss. I feel most at home in this compact island because it has suffered and endured. It mirrors my inner landscape. In 2006, I wrote a memoir about grief and healing entitled “Seaweed and Shamans—Inheriting the Gifts of Grief.” My narrative was reflective, not prescriptive because everyone’s healing journey is unique. In my epilogue, I wrote “You may wonder after a decade, are we finally healed? If being healed means living your life more meaningfully, and accepting the bittersweetness of it all, I would say, yes. Laughter and joy did return into our lives.” But not without private moments of regression and tears. Fast forward to 2018. I surprise myself when I do the math. Twenty four years have already passed since Tommy’s death. I am saddened that there have been more years without him than with him. Since his absence is present everyday, I often imagine him more than remember him, and sometimes feel guilty for that. Even though I don’t feel the same piercing grief as before, I still ache with a yearning and a longing for time we were never granted. Events that will never be shared. A future that will never emerge. I think it is natural and human for me to feel this way. So I remind myself often that “comparison is the thief of joy.” What is, is. If I experience something that triggers a memory or epiphany, I am consoled. In Jeju, when I watch the haenyeo harvesting seaweed, I am often reminded of two Mrs. Kims, Korean-American mothers who prepared miyuk-guk (seaweed soup) after the birth of our first son, and after the death of our second son. Each time I am served a bowl of seaweed soup, I recall their generous overture and compassion. When I spot the shadow of a tree trembling on my wall at bedtime, I remind myself that no matter how shaky the tree may appear, it will still be standing upright the following day. Life resumes. The opacity of one’s dreams eventually slides into focus. In 2015, my husband and I began to search for property that would allow us to build a small, 900-square foot house—one that would be eco-friendly and in accordance with cultural preservation. We found an abandoned, decrepid stone house in Aewol Village, on the northwest coast of the island. What was projected to be a 5-month project ended up taking one year and a half. We survived a grueling and steep learning curve, never having built a house before in a country with only Korean-speaking workers. Now, having lived in our fishing village for two years, we are certain that our decision to live here is right. Mother Nature’s four seasons teaches us that following decay and death, there is always renewal. Likewise, building a house required taking risks and having faith that after demolition, we could begin anew and adjust to the ways of this aging traditional community. Having lived overseas once before, we’ve learned to remain open-minded in our expectations. Each day is determined less by appointments, and more by serendipity. When I pass a neighborly granny on the road, she sounds off, “Where are you going?” Or another villager notices my grey hair and seeks reassurance, “Halmoni?” You’re a grandmother like me, right? When the postman delivers a package, he announces his presence before stepping inside to plop the box on our living room floor. We smile, say thank-you, undisturbed by what others may view as intrusive. Village life is all too familial—curiosity simply overriding privacy. My essays herein hopefully offer a glimpse of what I’ve learned in the course of engaging the landscape, history and people around me. 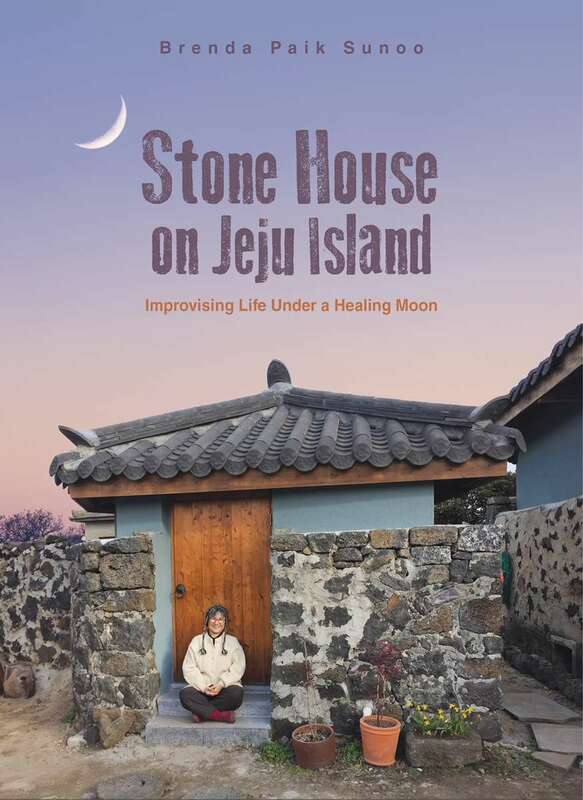 “Stone House on Jeju Island” is organized into three parts. This is because my relationship to Jeju feels as though I parachuted from the sky first, then landed on earth and eventually dived into the sea. I’ve tried to capture this descending trajectory by sharing the background of my introduction to the island in Part I: The Seduction. Then, the decision to build a house in Part 2: The Construction. And finally, our move to Aewol Village in Part 3: The Immersion. Lastly, in my epilogue, I excavate more family history of my grandfather, Rev. Yim Chung-koo, who charted this unexpected course back to Korea before I was even born. While building our house, one of the construction workers seemed perplexed. “Why are you building a new house in a foreign country at your age?” Why not? Building a house on Jeju Island is a declaration of optimism and hope even as we grieve the diminishing years of our mortality. It’s returning to the womb—a nourishing space to dwell with contentment. We broke ground on our property during Chuseok, one of Korea’s most important lunar holidays. This is when families near and far visit their hometowns to hold memorial services in honor of their ancestors and to enjoy their time together, feasting after the autumn harvest. Life on Jeju Island is like that. Finding the time to slow down and inhale the lustre of another full moon. May these stories of an improvised life engage and heal our mutual han.